Part 1 Basic principles: Properties of foods. Part 2 Ambient-temperature processing: Raw material preparation; Size reduction; Mixing and forming; Separation and concentration of food components; Food biotechnology; Irradiation; High-pressure processing; Minimal processing methods under development. Part 3 Processing by application of heat: Heat processing; Heat processing using steam or water; Pasteurisation; Heat sterilisation; Evaporation and distillation; Extrusion; Heat processing using hot air; Smoking; Baking and roasting; Frying; Heat processing by direct and radiated energy. Part 4 Processing by removal of heat: Chilling and modified atmospheres; Freezing; Freeze drying and freeze concentration. Part 5 Post-processing operations: Coating; Packaging; Filling and sealing of containers; Materials handling and process control. 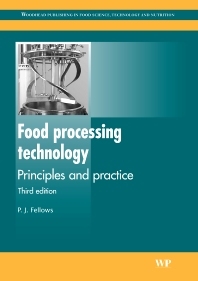 The first edition of Food processing technology was quickly adopted as the standard text by many food science and technology courses. This completely revised and updated third edition consolidates the position of this textbook as the best single-volume introduction to food manufacturing technologies available. This edition has been updated and extended to include the many developments that have taken place since the second edition was published. In particular, advances in microprocessor control of equipment, ‘minimal’ processing technologies, functional foods, developments in ‘active’ or ‘intelligent’ packaging, and storage and distribution logistics are described. Technologies that relate to cost savings, environmental improvement or enhanced product quality are highlighted. Additionally, sections in each chapter on the impact of processing on food-borne micro-organisms are included for the first time.